Last weekend, as many of you might recall, was the Weekend of the Susies. 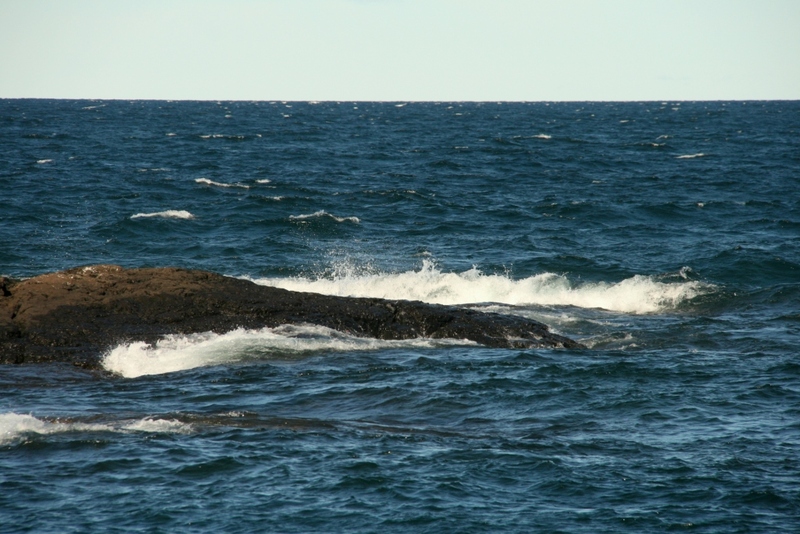 The Black Rocks, rumors say, lie jutted along Lake Superior as some of the oldest stones on the planet. It’s a wonderful place to stroll with a real live blogging friend. 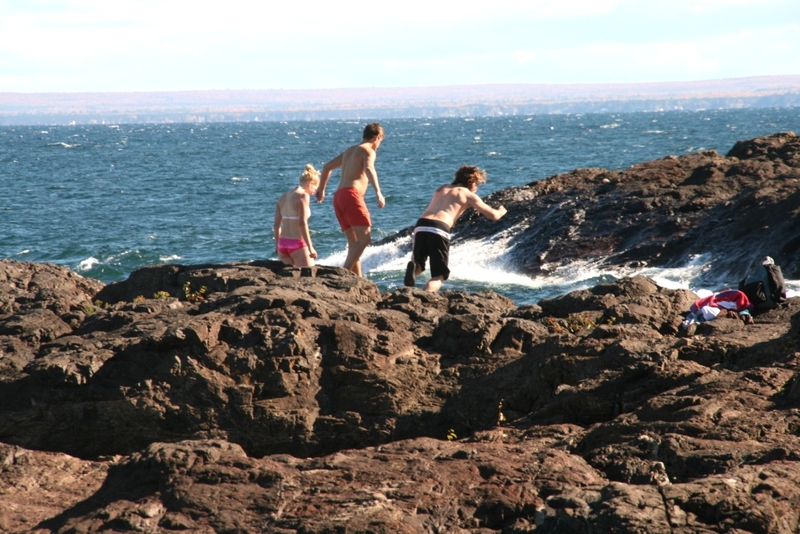 The Black Rocks are also famous because the young (and young-at-heart) actually jump off a cliff into Lake Superior far below. I am a scaredy-cat-at-heart and *probably* would never do such a thing, although I suspect Suzi might. 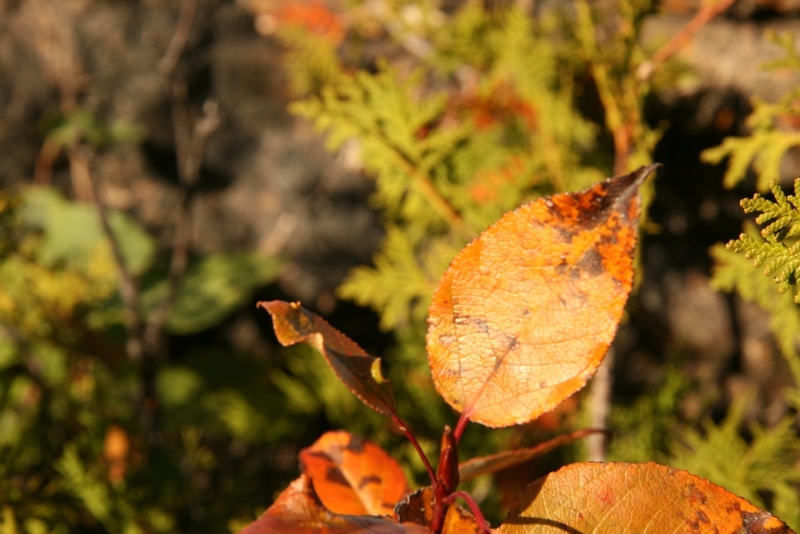 The wind blew fiercely, cutting through the thickest of clothes. Let’s just say the scenery warmed our souls. I’ll just let you look at the pictures now and pretend you were with us, shall I? P.S. You’ll never guess what happened (or didn’t happen, depending on how you look at it.) 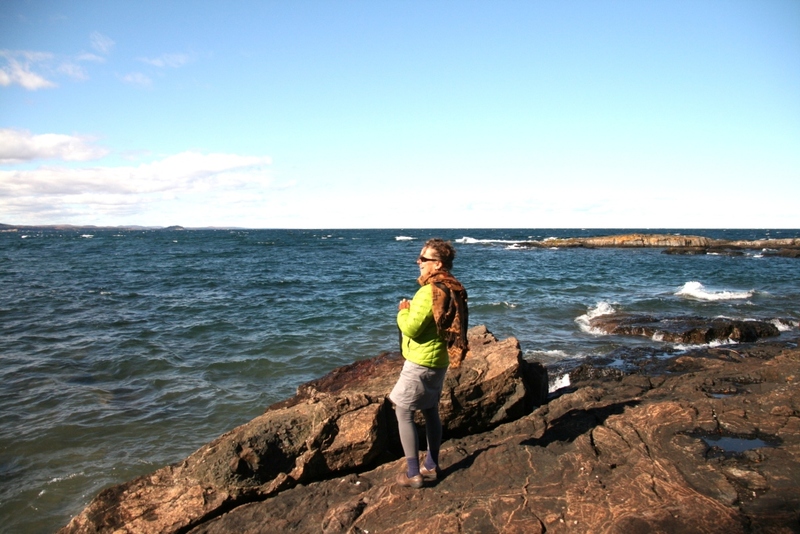 Kath Usitalo, from Great Lakes Gazette, later said she visited the Black Rocks at the very same time! She asked if we noticed a splatter painted jeep. I, of course, only noticed Suzi, the lake and the Black Rocks and the man who joked about the jacket. Oh, and the cliff jumpers and the cedar and the algae, but no, did not even LOOK at vehicles in the parking lot. Suzi, observant soul that she is, had SEEN the splatter painted jeep! 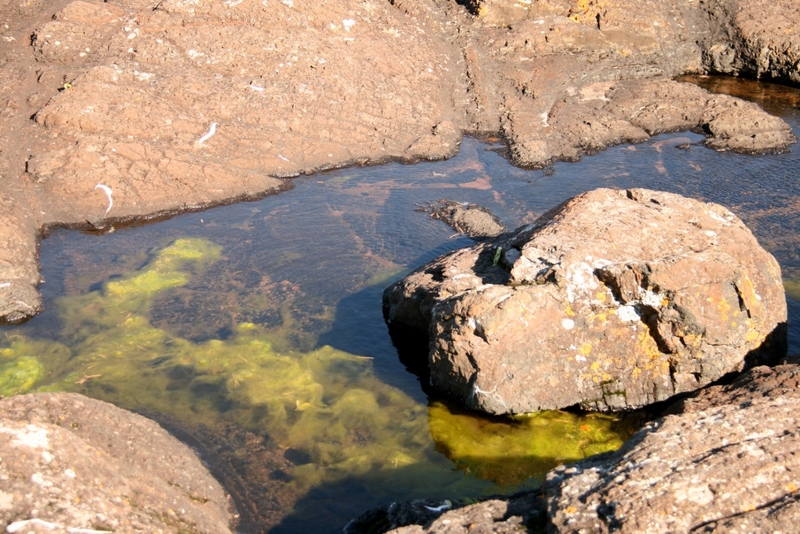 So another blogging friend was loose on the Black Rocks at the very same time! Isn’t it a small blogging world? 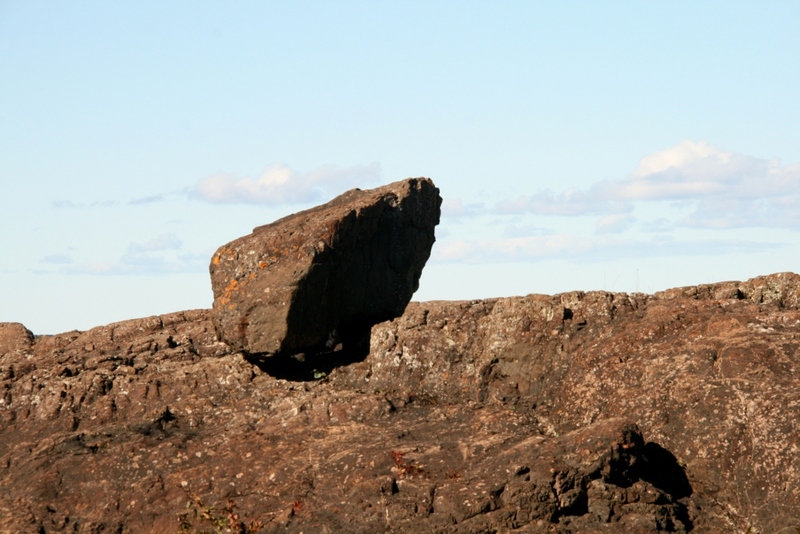 Jutting rock. He contemplates the jumpers. Oh look, here’s a brave one! 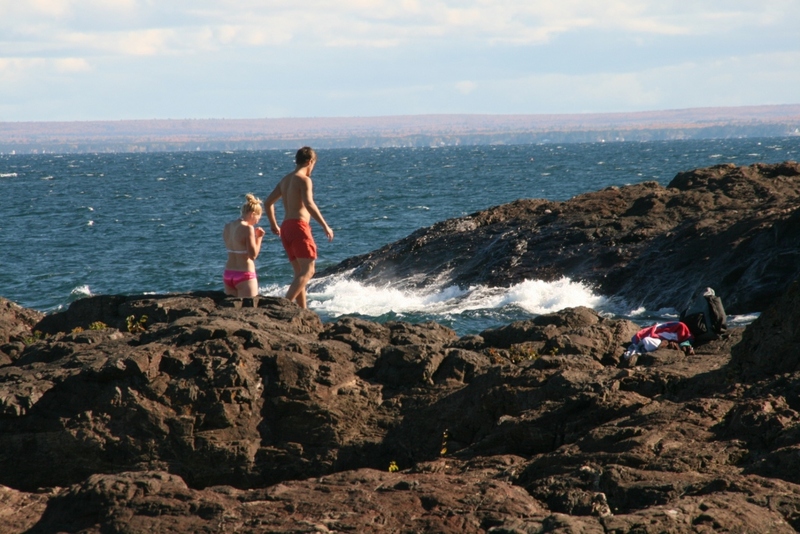 Swimming in Lake Superior in October; can you imagine? Just a final question, dear reader. 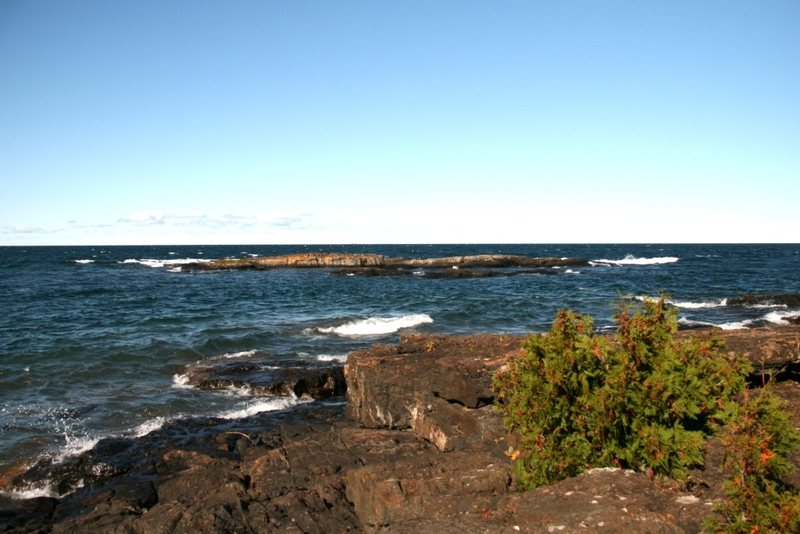 Would YOU have leaped from the Black Rocks cliff into Lake Superior in October? Are you more of a dare-devil jumper or rock-squatter sipping steaming tea? 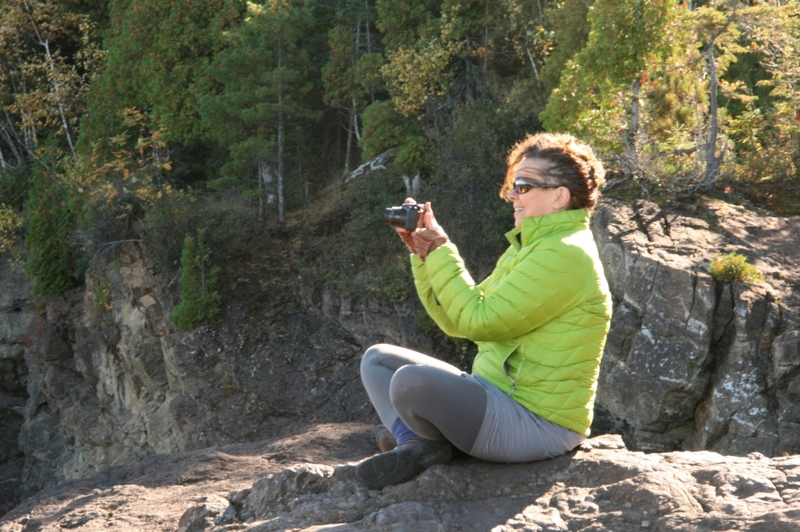 This entry was posted in October 2013 and tagged Black Rocks, blogging friends, Kath Usitalo, Lake Superior, Michigan, nature, photography, Presque Isle, Suzi Banks Baum, Upper Peninsula. Bookmark the permalink. 34 Responses to Dare-devil cliff jumper or rock-squatter sipping tea? Oh, I would definitely be a rock-squatter sipping steaming tea, Kathy. We’re big picnickers in our family. 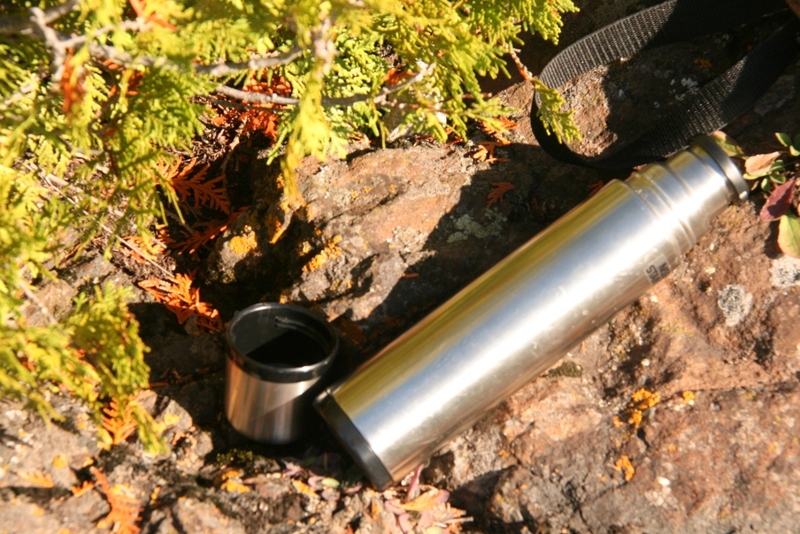 Love your lake-side adventure with Suzi BB. No way I would have jumped. 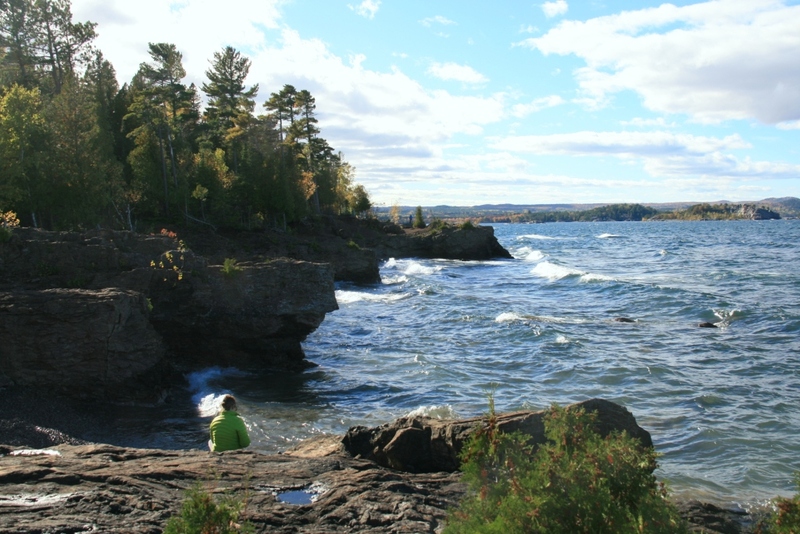 I would have grabbed the tea and joined the Kathys watching Lake Superior. 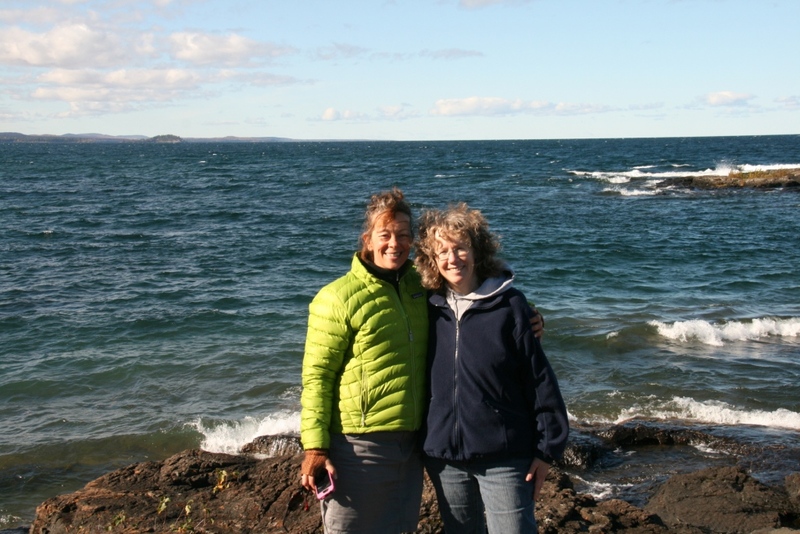 No, Kathy, no I wouldn’t jump into Lake Superior in October. There was a time, though, when I was a teenager, when I jumped off the pier at Scituate Harbor (Massachusetts) into the 46 degree water for lifesaving class. Really fine photos here. 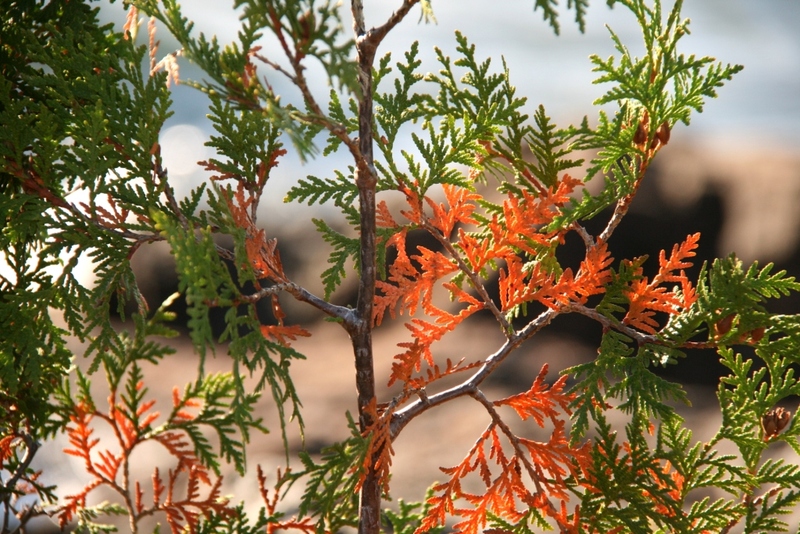 Love the ripples and the colors of the cedar turning orange and the way you relay the color and vastness of this lake! 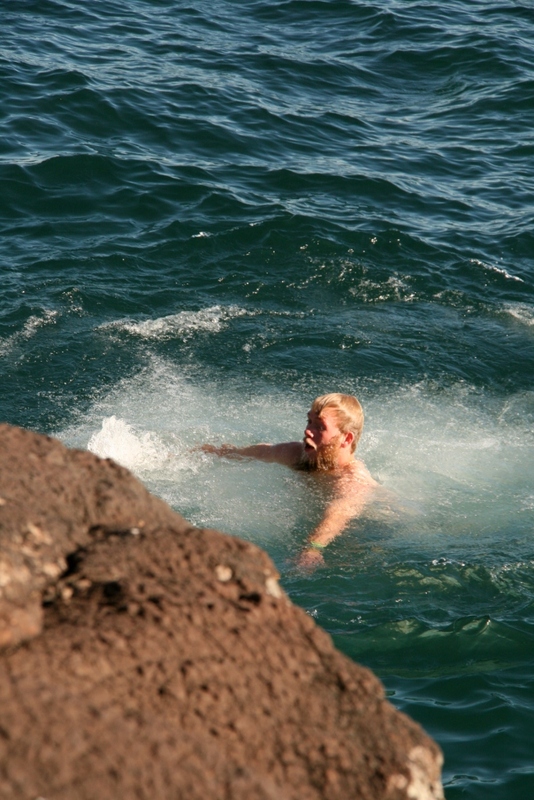 I’ve been swimming in Lake Superior in August, no way I’d try it in October. I’m definitely a cliff jumper into the water sort. It’s fun! These days, the water would have to be a lot warmer for my old bones, though. Such a wonderful day, Kathy, with fantastic photos! So glad you shared the adventure! I wouldn’t go by myself, but it would only take one friend to persuade me that we should do it. Or even one friend I could persuade to do it with me! I’ve often thought of doing the thru-the-ice jumps in the winter, but only if I have a friend to be crazy with me. Crazy likes company just as well as misery you know. I love the face on the guy as he emerges from the lake. You can see by his face exactly how not-warm that water is! Kathy – I’m drinking in the beauty of this heartwarming post as I sit here with another cuppa morning tea — a double delight! I jumped into a fjord in Norway and the water was so icy I actually thought my heart would stop. It wouldn’t be the height that would stop me from jumping off the cliffs into Lake Superior, but I guarantee you, the temperature would definitely stay my leap. Jump?! No no! My heart would surely stop and I’m not ready for that. Too much beauty to enjoy there first. And, of course, the tea. I will go with the tea drinking crowd. 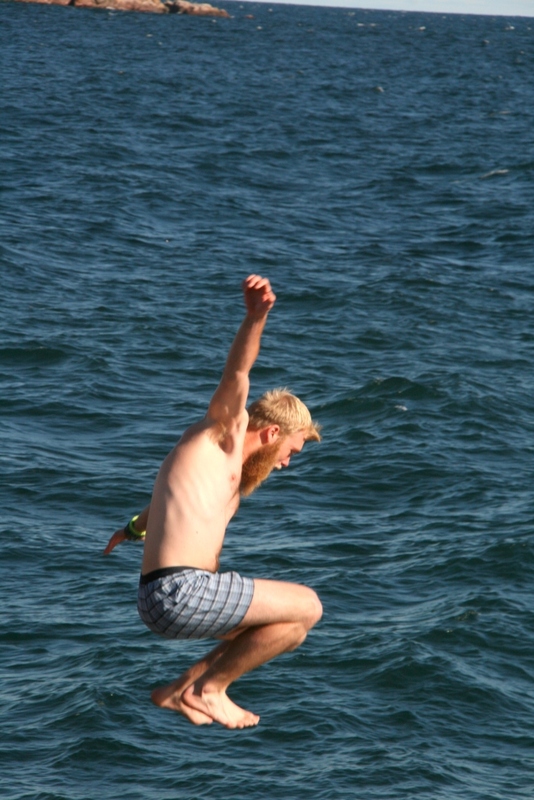 I shocked both my girls when I jumped off the pier into Torch Lake….in July on a very hot day. No way would I jump into Superior in October! 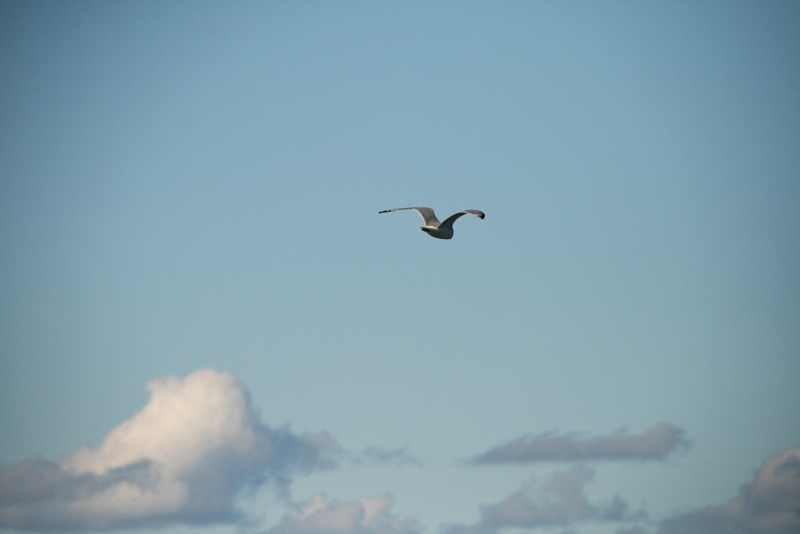 The lake was beautiful last Sunday, lovely photos! Most definitely a rock sitting tea sipper. Brrrrrrr. Thanks for taking me along. 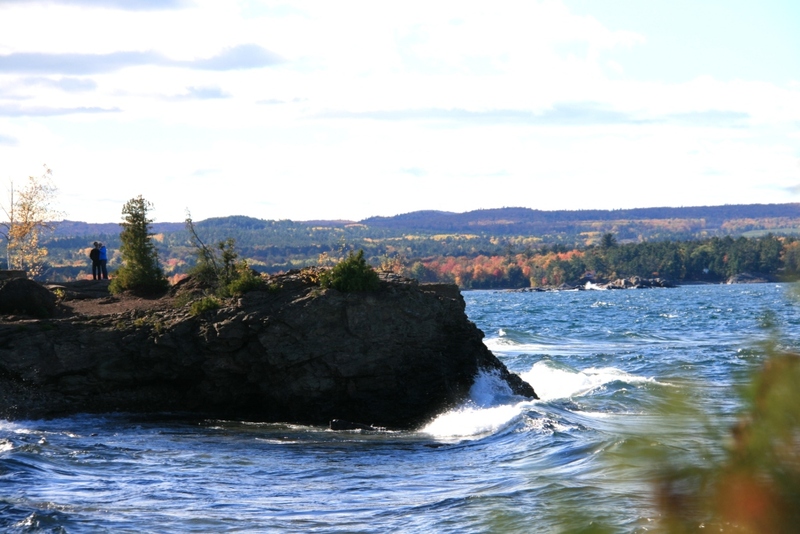 Lake Superior is beautiful, beautiful, beautiful. Great experience sharing your experience. Love your photos and accompanying dialogue. Thanks! 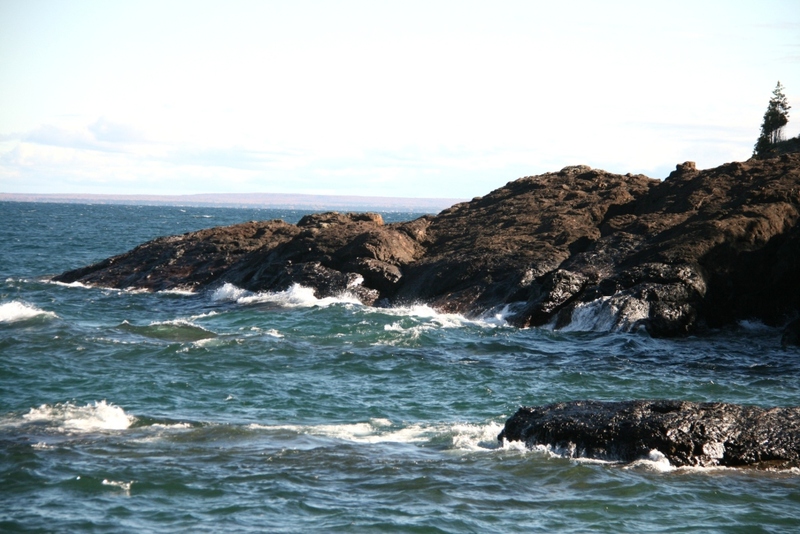 No, No, No…I would not have leaped from those rocks because it sounds like the water is too cold. If it were warm water on a warm day, yes. What a lovely area you live in. What a wonderful post, Kathy. I LOVE meeting blogging buddies in real life. Looks like you all had a fabulous time out on those rocks. What a glorious setting! I, too, would be too scared to jump off those rocks. YIKES! Absolutely positively would not jump voluntarily into Lake Superior in October. Doesn’t someone need to be a bit of a nut case to jump into the cold water? I dont call it cowardly or whatever name you might want to give to anyone not wanting to jump off those rocks. I simply call being smart and realistic. I’d have sipped hot tea and felt no envy at all. I would not jump. It would be too cold for me. I love these pictures. Such a beautiful place. I am glad you shared them. In Your photos I love cliffs and rocks. I would not jump!!! For some reason, I thought you and Suzi were sisters…you know, real blood sisters!? 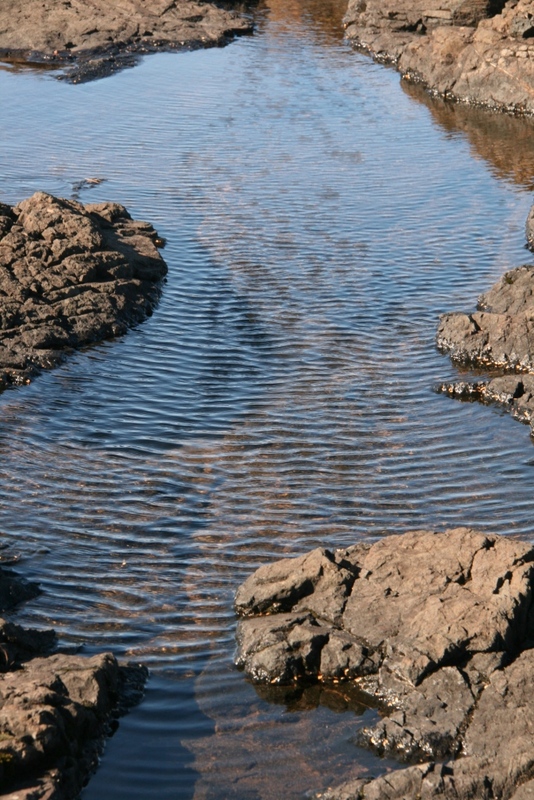 I would definitely jump into the lake…a cold water plunge is exhilarating. Loved the photos! Jump off the proverbial cliff? It seems there are many cliffs, not involving cold water below that I continue to tumble right on over them suffering whatever the consequence. Neat post. 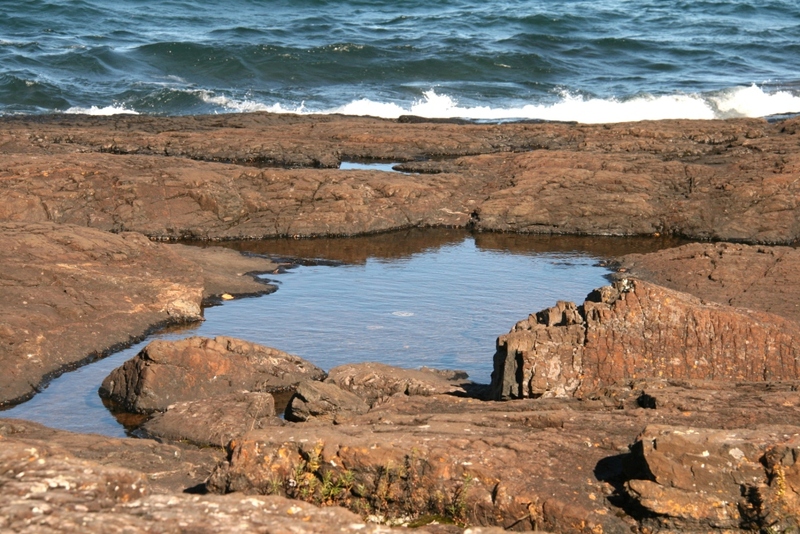 I am a “rock squatter”-I would rather just stand on the rocks and admire Lake Superior from there. 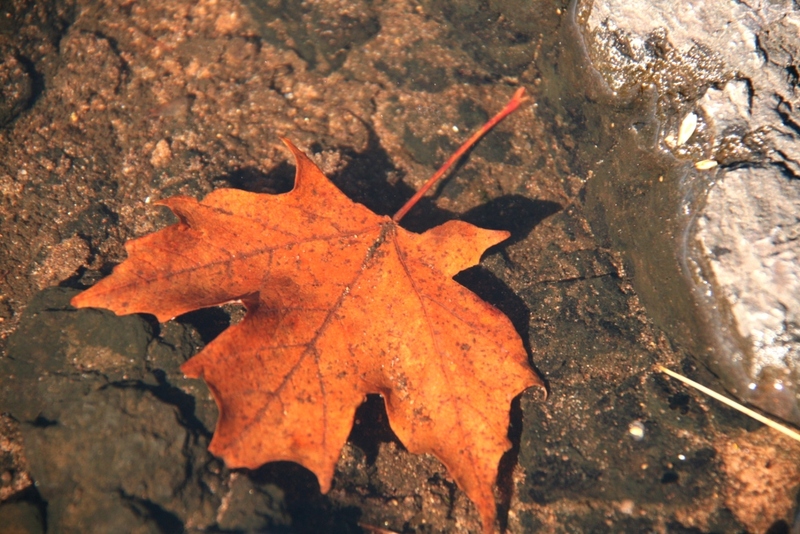 I would never leap, but boy would I love to sit with an easel and my oil paints and capture those shots.